You know that feeling when you hear about a strategy or intervention that you intuit has incredible potential to impact the lives of students for the better? I heard about a technique years ago from a friend of mine, Melissa Root, while she was in graduate school that gave me that feeling. I was intrigued by it at the time but never thought about the possible far-reaching applications and impact of this technique. Now my friend holds a Ph.D. in Educational Psychology and has just published a book, Picture Perfect: Video Self-Modeling for Behavior Change, and started her own business, Root Success Solutions, offering training and direct consultation using the technique. The technique is called Video Self-Modeling (VSM) and I think anyone who teaches, especially those who teach children with special needs, should know about this technique. Chances are they know a student who could be helped by it. The premise is pretty straightforward; people who see themselves performing a positive behavior change tend to continue to exhibit that behavior. For years, people have used visualization to manifest desired outcomes, especially athletes, but with today’s technology that approach can be taken one step further. People can actually be recorded performing the desired behavior change and then watch themselves doing it. The research suggests that once your brain sees that it is possible, whatever barriers your brain had created to performing that behavior change seems to break down. Way back in graduate school before she was Dr. Root, my friend told me about a child with selective mutism who would speak at home to her mother but not at school with her teacher. So, my friend and the professor with whom she was working videotaped the mother asking her child a series of questions and the child answering those questions. Then they videotaped the child’s teacher asking the same questions at school. Next, they edited the tape so the child would see the teacher asking the questions and see herself answering the teacher. Even though the child knew the tape was of herself answering her mother’s questions, through the magic of technology the child “saw” herself talking to her teacher in school. The child overcame her mutism and began speaking without abandon at home and at school. Dr. Root talked about how socially reinforcing speaking at school was, how all the other students were so excited to discover this student could talk. How life-changing this must have been for that child! What Dr. Root pointed out in a recent radio interview (at the third hour, six-minute mark) is that back when she first started this work in the 1990s, videotaping and editing required expensive equipment but now, anyone with a smartphone and a computer can successfully use the video self-modeling technique. With only 30 seconds to 3 minutes of video viewed every few days for 4-6 weeks, desired behavior change can be manifested. While the initial videoing and editing is a time investment, the subsequent viewing and charting of behavior can be done easily and quickly. What an incredible return for so little investment! Dr. Root reports this has been utilized successfully with a wide range of clients like athletes to improve lay-up shots, a spina bifida sufferer to learn to swim, and a man with developmental delays to perform his daily routines and work without becoming verbally aggressive. In graduate school, a professor of mine explained how a child with whom she had worked had a stutter that was very debilitating but that when the child spoke using a puppet, his speech was fluent. I wondered how VSM could be leveraged to help this child speak fluently without a puppet on his hand. When I asked Dr. Root, she explained that if you wanted this child to be able to speak fluently to a fellow classmate, you simply needed to record the child speaking with the puppet (in a voice that closely resembled his own) to the classmate keeping the puppet out of the shot (or editing it out). This way, when the student views the video, he only sees himself speaking fluently with a classmate. Brilliant! I am so excited about the implications of this work. Video self-modeling clearly demonstrates how powerful visual messages can be and how the media arts really do have the potential to change how people behave. How many students can you think of who could benefit from seeing themselves doing something well or exhibiting behaviors that would ultimately get them the kind of attention and reinforcement they desire and need? 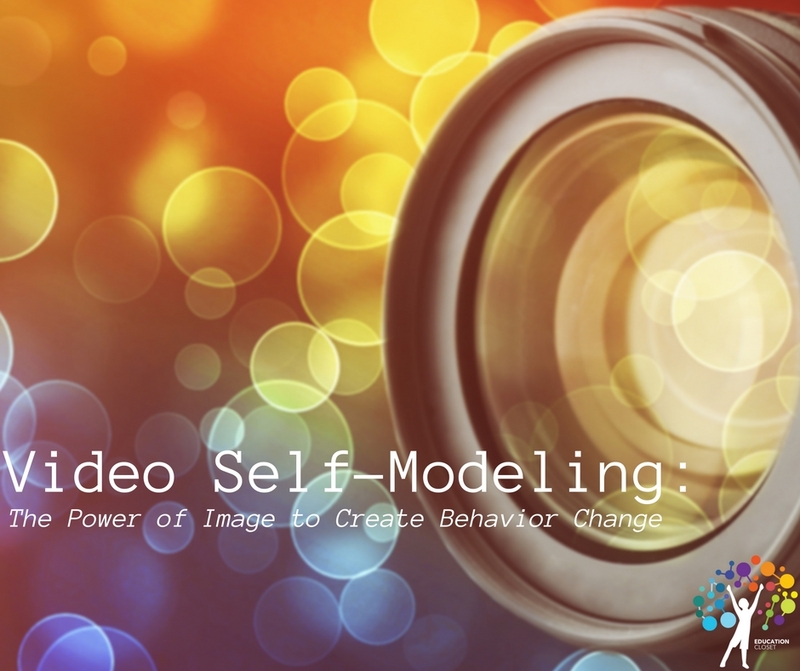 How many behaviors can you identify that some of your students could benefit from actually seeing themselves doing through video self-modeling? What an empowering lesson for children – that by envisioning themselves doing something well, they can make it happen! And with today’s technology, they can actually see it with their own eyes.